"Robert Rosenthal, a World War II bomber pilot who twice survived being shot down in raids over Europe and later served on the U.S. legal team that prosecuted Nazi war criminals at Nuremberg, has died at age 89." "A human being has to look out for other human beings or there's no civilization..."
Rest in Peace Sir. A lot of people still feel that way. A few good pics at the link, and the reason I wrote 'seems' above, is that in the handful of pictures at the link, someone saw fit to include a couple of pics protesting the US in Iraq from an earlier protest. This reflects either some sort of attempt at 'balance' or more likely very poor keyword discipline combined with an automated gallery building routine. I lean toward believing it is the latter, since that would imply incompetence vs. evil. I REALLY AM still trying to close out the AF Reshaping BS series -- Honest! The hard part is getting the answer nobody wants to hear into a form that somebody will at least attempt to read. IN the meantime, I just found a piece about how AF readiness is down at www.noangst.blogspot.com (could not get link to work for some reason, but the link is still the title of this post if you want to try it). I intend to start visiting there regularly myself. The problem is rooted in trying to do a Superpower's job on less than a Superpower Sidekick budget. 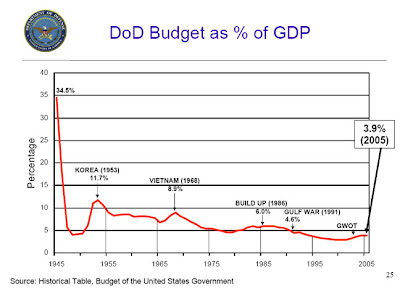 3.9% (or less) of GDP (Source: slide 25) for defense and that's WITH a war on? Gimme a break! 200,000 people. The numbers are way up from last month’s event and it was a very cold day. Encouraging! Maybe there ARE more Ataturks out there. “The current government is led by a party with its roots in Islamic politics while the civil service is one of the guardians of Turkey's secular status. Seal Your Borders as Best you Can...Stay Where You Are...And Shut Up! If Turkey couldn’t find its way to let the 4th ID open up a Northern Front in the last march on Baghdad, thus causing us innumerable (and thank goodness not insurmountable) difficulties, What makes the good general think anyone should care about how the outcome of this war is now causing them problems? I should note I have a generally favorable opinion of the Turks, and hold their military’s historical warrior ethos in high regard. I am a great admirer of Mustafa Kemal’s efforts (not all his methods and objectives obviously) to bring Turkey out of the dark ages, and of his military and political acumen that allowed Turkey to survive and thrive post WW1. But ever since Iraqi Freedom, I’ve concluded that there just aren’t any "Ataturks" in Turkey anymore. "Special guest host William Jefferson is tasked to find a pile of missing cash after those zany peaceniks start turning on each other. Hilarity ensues. " 1. British servicemen and woman had their uniforms taken away and made to read ridiculous statements about their alleged “guilt” of straying into Iranian waters. 2. Furthermore, the female sailor was forced to wear a head cover in keeping with Iranian law and the local mullah’s interpretation of the faith. 3. The female hostage reads on camera a ‘heart-wrenching’ statement to her young offspring. 5. Iran said it would release the female hostage. 7. Britain keeps working furiously to get the EU off their collective fat a** and make Iran feel the pain for their piracy. 8. The Mad Mullahs and the twerp (Ahmadinejad) tried to whip up a frenzy in the populace, that didn’t seem to work all that well. Look Chaps, if it were just up to us, we would be more cooperative, but my stout Friend here thinks we should just cut off your oil and gas flows and watch you squirm a while, so you shall be reasonable fellows won’t you? 11. The EU informs the UK that under no condition will they get off their fat a**, but they will send a very nice letter of regret. 12. President George Bush is roundly tut-tut’ed about using the word (gasp!) ‘Hostages’. 13. Iran sees this scheme isn’t playing well on the home front either and says “deal, but we get to parade the hostages around one more time”. "They should never have been taken hostage in the first place. They shouldn't have been using them for propaganda". 15. In what is probably proof-positive Iran didn’t like how this was playing out at home and abroad, they actually send the Hostages home and declare victory. 16. Everyone wants credit. Syria is claiming a role in the release. 17. Oh no! Syria was fitting that fabulous ‘Dhimmi Dahling’ Nancy Pelosi for a burqa at the time. How long before she claims credit as well? Anyway, enough of the politics! I'm sure there will br much more hand-wringing and recriminations to go around for a while. Welcome home to my Brothers-and-Sister-in-Arms! Well I wish now I had seen the Brit's press conference after they got back in the UK before I posted last night. If I had, I would have looked for the full videos of them in captivity instead of relying on quick clips, still pics and written reports on what they looked like and how they conducted themselves. Since the press conference's reading of a prepared written statement looked a lot like CYA to me I got a real uneasy feeling, so I thought 'let's go to the videotape' . Ugh - it made me physically ill.
Of course, no one can say exactly what they would or wouldn't have done unless they were there, but I can't imagine any of the Brits I worked with in the 80's or now EVER smiling for a captor's camera UNLESS it was supported by an obscene gesture. My personal lesson-learned in all this is: Don't rely on excised video clips and stills with transcripts when there are full recordings out there. The feeling I have now for these guys (including their command structure), is basically the same feeling I had once on jury duty. I want to scream -- "c'mon guys, give me something positive in your defense!" I decided to watch this situation closely for a while, and so far it hasn’t disappointed. I could boastfully claim clairvoyance with my ‘Triple Dog Dare’ scenario in the earlier post, but that would be just 'wrong', and well...way over the top. I mean, it is far more useful to point out that the best alternatives to follow are SO obvious an old ‘ammo troop’ can see what needs to happen just as easy as a former Speaker of the House (Hugh Hewitt podcast). Later in the week on HH, Guest-Host Congressman John Campbell had Victor Davis Hanson on and asked him (podcast) what he thinks should be done to get the kidnapped British servicemen and woman back, and he suggested what was in all reality a much better answer involving world and more specifically EU economic sanctions. I guess it never occurred to me to try that path because I considered it infeasible – and for obvious reasons, I still do. Note: read the comments below the article in the last link. Britain has as many ‘Blame the UK First’ idiots as we have of the ‘Blame America First’ variety. Woah! – ‘Instapundit’ found the same Guardian article worthy of mention.....and the EU gets 'Insta-smacked'!